My name is Patric Gaffney, I have been fishing the Pacific Northwest and Alaska my whole life and if there is one promise I can give you it's that fishing is my Passion and livelihood! I am the owner of Gaffney's Washington fishing guide service, and being a fisherman my whole life, I always knew I wanted to be the best angler I could be. Being a younger man, I pride myself in my drive, work ethic, and commitment to providing quality trips and giving my best effort to fully satisfy my customers. I have been fishing the Washington state area rivers for over 15 years. I was born and raised in Gig Harbor, Washington where ever since I was a child, I have been chasing any fish in any body of water. I have spent many days on the water learning and adapting to today's styles and techniques of the sport fishing industry, and can honestly promise any client of mine I will devote all of my knowledge and skill to give you a experience that you will never forget! By choosing Gaffney's fishing guide service, you are embarking on a true fishing adventure traveling to the pristine waters of Washington's Olympic Peninsula and Southwest Washington rivers where the stories of the Northwest's rivers come to life in front of your eyes! I am CPR/First aid certified, along with years of experience commercial fishing and safety at sea training to insure you a safe and professional trip. 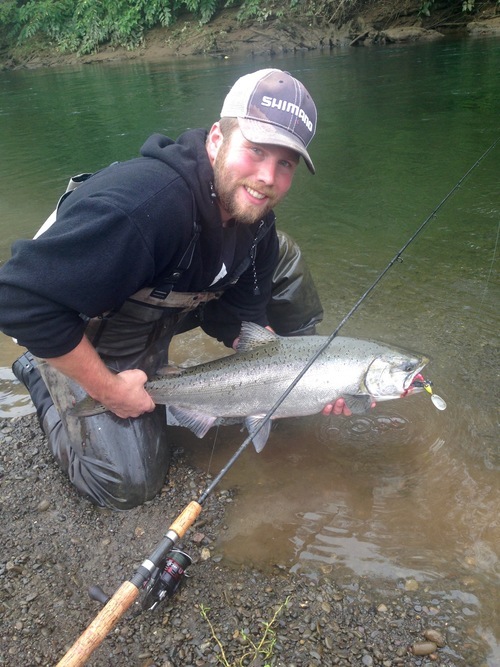 Gaffney's Washington fishing guide service will put salmon in your cooler every time! Visit our pricing and guided fishing trip booking page, for fees and other information about our fishing charters.